MELVILLE, NEW YORK, June 19, 2007 - FONAR Corporation (NASDAQ-FONR), The Inventor of MR Scanning™, announced today that the Intellectual Property Owners Education Foundation (IPOEF) has selected FONAR president and founder Professor Raymond V. Damadian, M.D., as the 34th winner of the ‘National Inventor of the Year Award’ for the invention of the FONAR UPRIGHT™ Multi-Position™ MRI. The award was presented to Dr. Damadian at the Caucus Room, Cannon House Office Building of Congress, Washington, DC. It was presented by The Honorable Congressman Howard L. Berman (D-Calif.), Chairman of the House Judiciary Subcommittee on Intellectual Property. 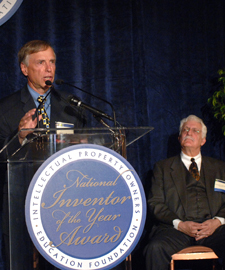 The IPOEF ‘National Inventor of the Year Award’ has previously been presented to such distinguished inventors as Robert Jarvik, M.D., for the Jarvik Seven artificial heart, (1983), and Amar G. Bose and William R. Short, Bose Corporation, for the Bose folded acoustic waveguide loudspeaker system, (1987). 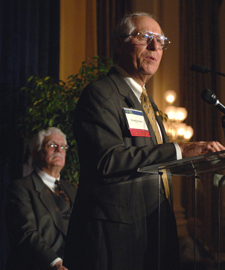 On the podium was ‘Distinguished Guest’ Dr. Donald B. Keck, Co-developer of Optical Waveguide Fibers (Fiber Optics) and Harry J. Gwinnell, President of the IPOEF. 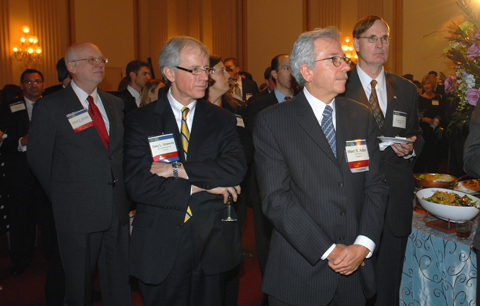 The IPOEF, based in Washington D.C., is a non-profit subsidiary of the Intellectual Property Owners Association (IPO). The award presentation was attended by approximately 200 people, mostly members of the IPO. 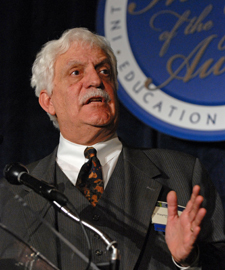 "We are delighted to honor Dr. Damadian with this award," said IPO Education Foundation President Harry J. Gwinnell. 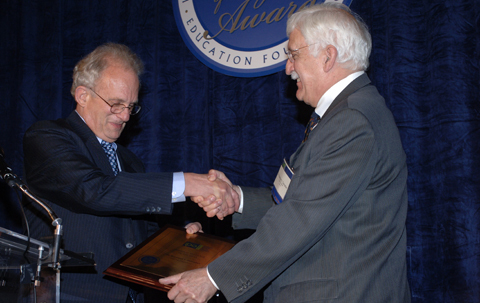 "His contributions to the field of magnetic resonance imaging, particularly with the Upright™ MRI technology for which we salute him today, have been critical in advancing modern medicine's diagnostic and treatment capabilities." Dr. Damadian has received widespread recognition for his inventiveness. 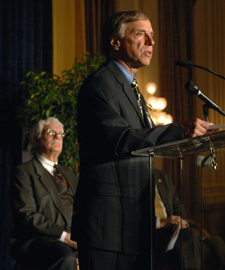 In 2004, he received The Benjamin Franklin Medal and The Bower Award for Business Leadership from the Franklin Institute, (visit: www.fonar.com/2004_bower_award.htm ). 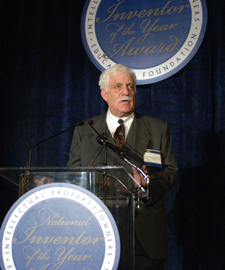 In 1988, President Ronald Reagan awarded Dr. Damadian the National Medal of Technology, the nation’s highest honor in technology, for the invention of the MRI (visit: www.fonar.com/medaloftech.htm ). 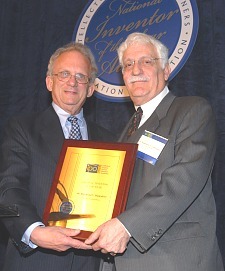 The Honorable Howard L. Berman, Chairman of the House Judiciary Subcommittee on Intellectual Property presents the National Inventor of the Year Award to Dr. Raymond V. Damadian of Fonar Corp, Inventor of the Upright MRI Machine. 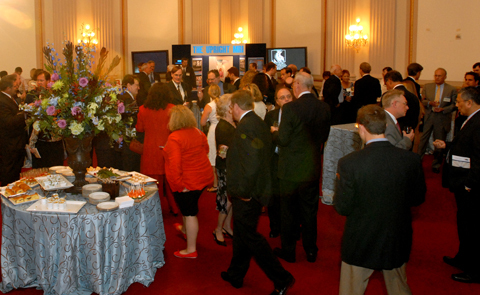 A packed crowd at the 2007 IOY Reception. The Hon. Randall R. Rader, U.S. Court of Appeals for the Fed. 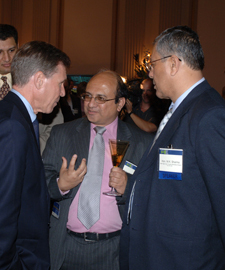 Circuit, Raghunath S. Minisandram, Klein, O'Neill & Singh, LLP, and Hon. M. K. Sharma, Delhi High Court. The Hon. Richard Linn, Court of Appeals for the Fed. 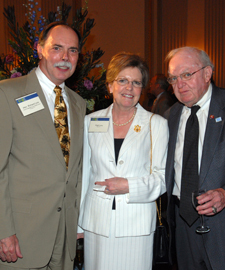 Circuit, Mrs. Patti Linn, and Congressman Howard Coble. 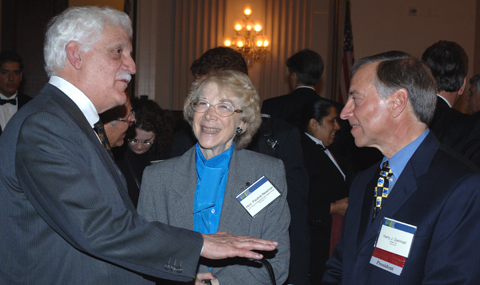 National Inventor of the Year Dr. Raymond Damadian, The Honorable Pauline Newman, Court of Appeals for the Fed. Circuit, and IPO Education Foundation Pres. Harry Gwinnell, Cargill, Inc.
IPO Education Foundation President Harry Gwinnell introduces Dr. Raymond V. Damadian. IPO Exec. Director Herbert C. Wamsley, IPO Past President Gary Griswold, 3M Innovative Properties Co., IPO President Marc Adler, Rohm and Haas Co., and Frampton Ellis III, Anatomic Research, Inc.
Dr. Donald Keck, co-developer of Fiber Optics presents opening remarks. Dr. Damadian speaks on invention and the upright MRI. Dr. Damadian at the podium. 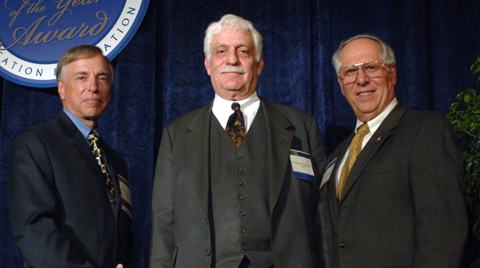 The Honorable Howard L. Berman and Dr. Raymond V. Damadian with the National Inventor of the Year Award. FONAR® was incorporated in 1978, making it the first, oldest and most experienced MRI manufacturer in the industry. 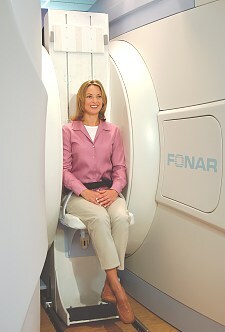 FONAR introduced the world's first commercial MRI in 1980, and went public in 1981. Since its inception, FONAR has installed hundreds of MRI scanners worldwide. Their stellar product line includes the FONAR UPRIGHT™ Multi-Position™ MRI (also known as the STAND-UP™ MRI), the only whole-body MRI that performs Multi-Position™ imaging (mpMRI™) and scans patients in numerous weight-bearing positions, i.e. standing, sitting, in flexion and extension, as well as the conventional lie-down position. The FONAR UPRIGHT™ Multi-Position™ MRI often sees the patient's problem that other scanners cannot because they are lie-down only. With nearly one half million patients scanned, the patient-friendly FONAR UPRIGHT™ Multi-Position™ MRI has a near zero claustrophobic rejection rate by patients. A radiologist said, "FONAR UPRIGHT™ MRI – No More Claustrophobia - The Tunnel Is Gone." As another FONAR customer states, "If the patient is claustrophobic in this scanner, they'll be claustrophobic in my parking lot." Approximately 85% of patients are scanned sitting while they watch a 42" flat screen TV. FONAR's latest MRI scanner is the FONAR 360™, a room-size recumbent scanner that optimizes openness while facilitating physician access to the patient. FONAR is headquartered on Long Island, New York, and has approximately 400 employees..